Hi all, just a quick update to mention that Tim Doyle is making some space in the Nakatomi Inc store room and offering 50 tubes of art for $50 each. Each tube contains not 1 but 5 silk screen posters plus other assorted goodies. The best thing is that random tubes will contain bonus prints and one tube will contain original Damon Carlton and a Polar Bear, Hurley's Curse / The Numbers artwork. 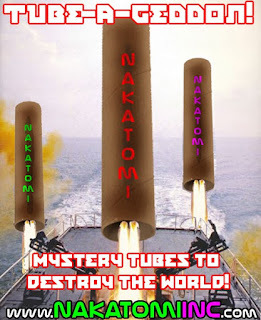 Click the picture above or click here to go to the Nakatomi Inc blog which explains all and has a link to the sale site. Actually the e-mail I got said 4 hurley's would be inserted random! On a side note: Before I put these up on ebay does anyone need the following (The Hatch, Hurley, Van, Love T, and Walt)-All artist edition. Moving and would love to sell the set togeather. I know I wont get anywhere near what was paid but a good offer could net 5 prints to a good fan! I've just seen that all the tubes are sold out now ! Just saw that too along with the post Zort. Good thing for me I was out of "the cloud" yesterday probably- the internet sure does encourage impulse buying! What'd you all get from Tim? Anything you're really excited about? Wow it's been a long time since I've posted here. Out of desperation I've listed my Lost by Stout poster on ebay. After only a few hours I have a few low ball offers. What does everyone think it's worth? I know that there was a website we used to track the posters that were selling but I can't find the link anywhere. Most of the offers are from people who are sellers so I'm afraid to sell too low? Hey all. It's been awhile since I've posted too. I've decided to thin some of my poster collection. The first I want to part with is Daniel Danger's Black Rock. Is anybody interested? I'll sell it at my cost. You can get a hold of me at timothymlong *AT* gmail.com. Thanks everyone for the help. I used that site and got a fair price. Great thing is it's going to a big Lost fan so I'm happy. I've been holding onto a spare Locke's secret T shirt. It still has it's tags and has never been worn. I can't find any of these for sale. What do you think it's worth??? What size is the T Shirt? Sorry I didn't realize you had written back . The shirt is a size XL. I got one in my size and I got an XL that I planned to frame. Well until I realized how much it would cost. LOL.